"Dancia Lewis is far from popular. And that's not just because of her average grades or her less-than-glamorous wardrobe. In fact, Dancia's mediocrity is a welcome cover for her secret: whenever she sees a person threatening someone she cares about, things just...happen. Cars skid. Structures collapse. Usually someone gets hurt. So Dancia does everything possible to avoid getting close to anyone, belieiving this way she can supress her powers and keep them hidden. But when recruiters from the prestigious Delcroix Academy show up in her living room to offer her a full scholarship, Dancia's days of living under the radar may be over. Only, Delcroix is a school for diplomats' kids and child geniuses--not B students with uncontrollable telekinetic tendencies. So why are they treating Dancia like she's special? Even the hottest guy on campus seems to be going out of his way to make Dancia feel welcome. And then there's her mysterious new friend Jack, who can't stay out of trouble. He suspects something dangerous is going on at the Academy and wants Dancia to help him figure out what. But Dancia isn't convinced. She hopes that maybe the recruiters know more about her "gift" than they're letting on. Maybe they can help her understand how to use it...But not even Dancia could have imagined what awaits her behind the gates of Delcroix Academy." "Fourteen (almost fifteen) year-old Dancia Lewis is is girl everyone sees but no one knows. She likes it that way. In fact, she does everything in her power to make it that way. Because Dancia is dangerous. From crashed cars to guys in comas, Dancia can Make Things Happen just by thinking about them. Horrible things. Things that hurt people. Even when – or perhaps especially when – she’s trying to help. Dancia lives in a small town in Washington state, in the shadow of Mt. Rainier. She’s pretty sure one day Rainier is going to explode and dump lava all over the city and everyone she knows. Her luck is just like that. Dancia is tall, with white-blonde hair that hangs in ringlets all over her head when she’s lucky, and in a frizzy blonde afro when she isn’t. She lives with her grandma, a small, gnome-like figure whose tastes run to matching track suits and baby-doll make-up. Thanks to Grandma’s medical problems, Dancia does most of the work around the house. This results in less-than-perfect laundry and a weedy backyard, but it also means Dancia gets to do things like drive the car home from the doctor’s office when Grandma has her eyes checked. Yes, it’s a little thing, but you’ve got to enjoy the little things in life, right? Especially when the big things are so completely messed up." If you want to learn more about Inara and the book, visit her website at inarascott.com. The Candidates will be released on Tuesday! 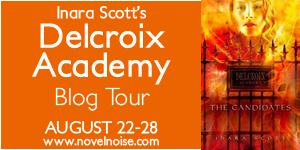 And if you want to follow the rest of Inara's tour, click here for more info! And now, the best part: thanks to the generosity of Disney Hyperion, you'll have the chance to win one of two copies of The Candidates! Just fill out the form below, and good luck! And be sure to check out the trailer! This book sounds intriguing! Thanks for the post and the contest! Author visit, video, and contest. How cool! I tottaly have this book on my wishlist :) Sounds pretty cool. Where She Went Teaser Tour! I'm in the San Francisco Book Review!